Emeritus Professor Gillian Triggs – An Australian Bill of Rights. Gillian Triggs was the President of the Australian Human Rights Commission from 2012-2017. She has combined an academic career with international commercial legal practice and worked with governments and international organisations advising on human rights law. She is focused on the implementation in Australian law of the human rights treaties to which Australia is a party, and on working with nations in the Asia Pacific region on practical approaches to human rights. Madeline previously practiced as a solicitor in Australia. She specialises in international human rights and refugee law, with a focus on the law of State responsibility, extraterritorial human rights obligations, offshore processing on Nauru and Manus Island, and the protection of children. Julian is an Australian barrister, human rights and refugee advocate, and author. He is known for his staunch opposition to the mandatory detention of asylum seekers, and has provided legal counsel in a wide variety of high-profile cases. Saba settled in Australia as a refugee after escaping persecution in Iran for her activism against capital punishment. She uses her artistic and cultural activities to campaign against the death penalty, advance the rights of women and children as well as give a voice to refugees and asylum seekers. Corinne Grant, lawyer, broadcaster, writer, comedian. Always committed to social justice, in February 2013, Corinne commenced graduate studies for the Juris Doctor law degree at Melbourne Law School She is currently working as a lawyer specialising in work related injuries, she is a well known advocate for refugees and asylum seekers. Professor Hill was appointed Foundation Chair of Social Ecology at the University of Western Sydney in 1996 where he taught units on Qualitative Research Methodology, Social Ecology Research, Transformative Learning, Leadership & Change, and Sustainability, Leadership & Change: A Social Ecology Perspective. Sister Jan believes that “All people fleeing persecution have a right to seek asylum, it is legal to do so, and the Australian government has both a legal and moral duty to care for asylum seekers, especially children.” Sr Jan will be presenting at the workshop ‘Key to Successful Campaigning’. Professor Susan Kneebone researches in the area of international migration, nationality and citizenship law, including refugees, statelessness, human trafficking, marriage migration and migrant workers, with particular reference to South East Asia. Para Paheer and his wife Jayantha. Para a Tamil Refugee, formerly a teacher in Sri Lanka is the author of the book The Power of Good People. Para will be presenting at the workshop ‘The Power of Story Telling’. Fadak is a lawyer and a refugee from Iraq. Her community legal work upholds human rights and ensures access to legal services for those marginalised. Before her current work in community development, Fadak worked in the refugee rights sector. Conference organisers have made arrangements with a number of accommodation providers for conference attendees. A range of cabins suitable for groups of up to six as well as caravan and tent sites. Let them know if you are attending the RAR Conference. There is a minimum of 2 nights. There will be no discount unless 10 cabins are booked and the discount will then be granted at the conclusion of your stay. Members from Northern Territory, Western Australia, Queensland and Tasmania are encouraged to apply for billets. Applications for billets will conclude on March 29, 2018. Courtesy of Cook Buses Wodonga/Hertz Wodonga, a FREE 25 SEATER BUS will be available to connect with a limited number of flights to, and departures from, Albury airport. There may be the occasional wait of around 30 minutes at the airport as a couple of flights come in at slightly staggered times. Flights arriving between 4pm and 8:30pm on Friday 6/4/18; Saturday 7/4/18 between 9:30am – 10:00am and departing Sunday 8/4/18 2:30pm – 4:40pm will be catered for. The bus will drop off at the Quest Wodonga, Wodonga TAFE accommodation, Big 4 Borderland caravan park or in central Wodonga for those staying in alternative accommodation. The bus will also provide a pick up from the Wodonga railway station, 3:30 Friday6/4/18 and a Sunday drop off back at the station at 5:15. To ease movement to and from the RAR conference venue at the Catholic College Wodonga, the bus will be available to collect and return attendees to and from the above accommodations. We are endeavouring to provide volunteer drivers to collect from the Albury railway station for 3:11pm XPT train from Sydney. For your convenience the taxi phone numbers are: Albury taxis 6025 2255; Wodonga taxis 6024 3444. If you would like to provide a billet, donate or volunteer for the Conference please send a message on the ‘Contact Us’ page of this site. 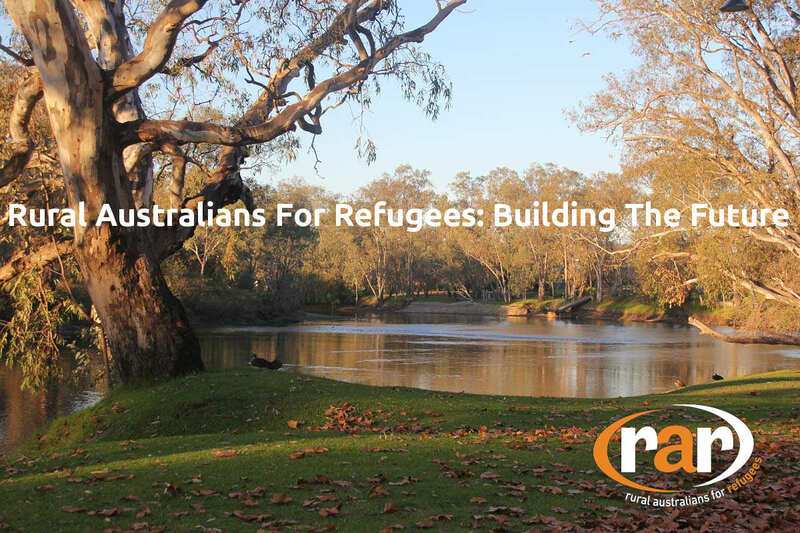 Rural Australians making a difference to the lives of refugees & asylum seekers.